The launch of Digital India Campaign, a programme to transform India into digital empowered society and knowledge economy, has given the citizens of the country a strong hope of intensifying the literacy rate. Followed by the initiation of this Campaign, fortunately, several telecom giants including have came forward to give high-speed internet connectivity in a minimal charge. Now, it will not be wrong to say that owing to such revolutionary initiatives, the Indian education system has received a real makeover. Although, the onset of online courses was always a path-breaker, today, given the easy access to the internet, the learners are able to embrace their dreams to the fullest. Anyone can pursue a desired course, from anywhere and anytime; the only two things an individual will be required is the internet and a computer/smartphone - thanks to Digital Learning. From getting in touch with virtual peer learners to contacting experts online and having 24x7 accesses to learning materials for hassle-free evaluation and giving exams, pursuing a course via digital learning centers makes it all possible. The most positive aspect that Digital Learning, however, has brought to the country is the abolishment of rote learning. Students are highly encouraged to learn at their own pace without putting any compulsion. In a nascent stage right now though, digital learning is giving a fair challenge to traditional classrooms. Foreseeing the bright future of EdTech industry, in the last few years, countless portals got commenced offering courses through online mode and students are in a dilemma regarding which portal will honestly and literally fulfill their requirements that they have as an online learner. In order to make the process of selecting the right Digital Learning Portal seamless, we at Higher Education Review have performed an explicit analysis of the best portals. 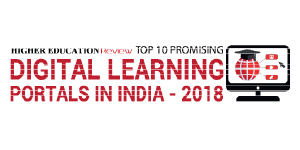 Our expert panel and researchers have put a sizeable effort in choosing the ideal learning portals for the learners and prepared a listing as 'Top 10 Promising Digital Learning Portals'. We aspire; the next few pages will be able to erase the struggle of the students as well as professionals with enrollment in the appropriate digital learning portal.